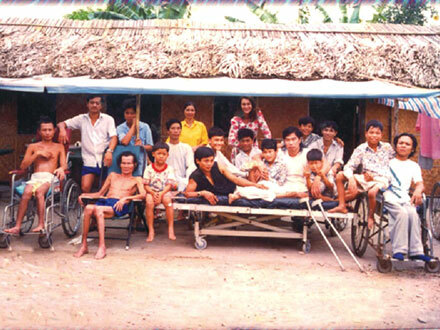 In 1993, a Swiss woman named Aline Rebeaud crossed paths with young disabled children and orphans in Vietnam. Rebeaud, a painter, has since closely connected her life with them. Nicknamed "Mother Tim", she is beloved by many. The sweet-smelling aroma of food comes in from the kitchen. A wheelchair is being slowly pushed backwards and forwards around big frying-pans while the cook concentrates on the food that she is preparing for her beloved children. It is the time that pupils are eagerly coming back home from school, they are very happy to smile and talk with each other. Maison Chance (Nha May Man) today doesn't resemble the same establishment it was in 1992. That was the first time Aline Rebeaud came to Vietnam, the last destination in her trip to Asia. One evening, Aline saw an orphan painfully crying at the corner of a street. Shortly after, she visited a centre for mentally disabled children at Thu Duc district where she met Thanh, a 12 year old boy suffering from palsy. This was a turning-point in her life. 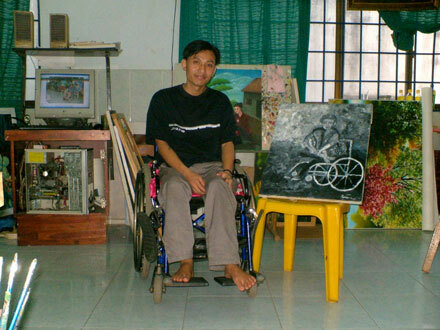 Thanh was not only paralysed but also plagued with other diseases of the heart, liver and lungs. Most people feared he would die soon but Aline was touched and decided to look after him for the next 3 months. This is how she earned her Vietnamese name, "Mother Tim", which means benevolent mother. Tim literally means "Heart." It was from then that Tim decided to help orphans and disabled people to live under the same roof. She gradually built a thatched roof in the suburb of the city, near Binh Hung Hoa cemetery in Ho Chi Minh City. She herself welcomed the children and looked after them, also spending time to teach them everyday. Tim sold her paintings to help earn money to take care of the children. In 1996, Tim met some people in Lyon, France and they decided to help establish Nha May Man. With the exceptional patience and energy of a young woman, Tim and her friends have been making Nha May Man more and more spacious, creating a better facility. Nha May Man provides a place for bed, board, studying, working, and physiotherapy exercises. It is a place that many people count on to improve their lives. Unfortunately, they are running out of space due to the rising numbers of people. With the support and efforts from many kindhearted people, another affection roof, named Chap Canh, was officially launched on February 18, 2006. This was an event of great joy for Tim and all of the people living at Nha May Man. This meant that all activities, including studying and working, could be held at Chap Canh centre and Nha May Man would be the place for bed and board. The problem that concerns Tim the most is that the majority of the disadvantaged people living here are illiterate. Many need apprenticing to earn their own living. The Chap Canh Centre has 5 classrooms for primary education, a health centre, library and 4 apprentice rooms for drawing, sewing, computer processing and fine arts. These classes allow students to learn not only theory, but also get real life experience through practise. After finishing the courses, students can stay and work at the centre with a reasonable salary, enabling them to improve their lives and help others. All the products produced here are sold in Vietnam and abroad (mainly in Switzerland and France). With the skills they learn, disabled people can earn money for themselves. Tim shared her compassion for those she works with: “If you were disabled, you could easily fall out of your wheelchair in the rainy season. It can be too difficult to take a bath with a 30cm high water tap. There are many difficulties that the disabled must face everyday, and this can cause them to feel very lonely." This motivated Tim to start building Lang May Man. “This village will include some apartments that are specially designed for disabled people that need to use wheelchairs. For those who can earn income, they must hire rooms in the village. We also have a restaurant, a coffee-internet shop and many other services that can create income for the organization. 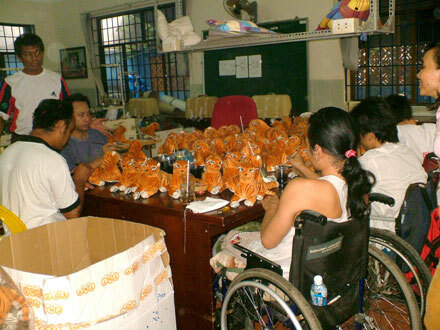 It will also provide foreign disabled people with comfortable accommodation when visiting Vietnam. This will be a place to bring both local and foreign people together to share and help each other”. On October 27, 2009, the ground-breaking ceremony in Lang May Man was officially carried out. 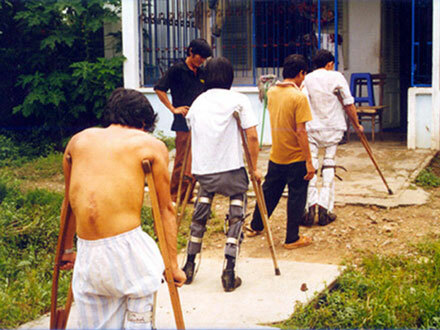 Barring any setbacks, the first apartment block for disabled people in Vietnam will be completed within 15 months.